Research have shown that having pets can improve the quality of your everyday life and help reduce stress. Therefore, owning one will probably get you through a difficult time (finals). These universities have enhanced students’ campus experience by having their very own four-legged friend or in Taylor’s situation a two-legged friend. Pronounced as Orange not Oren-J(confusing I know), Orenj the cat meow-ed into the university one day and decided to make it her home. This cute furry animal has since been INTI’s very own pet. Get this! Orenj has her own Instagram account with over 1,300 followers and counting. This Instagram-able cat has since been on student’s Instagram stories and feed. A celebrity cat! Who wouldn’t want a picture with a ginger cutie by your side? INTI students take time out from their day to feed and play with Orenj in return she accompanies them while studying. Orenj gave birth to two little kittens last year, Xun Xun and Golmol but they’ve since been adopted by students to take better care of the little ones. 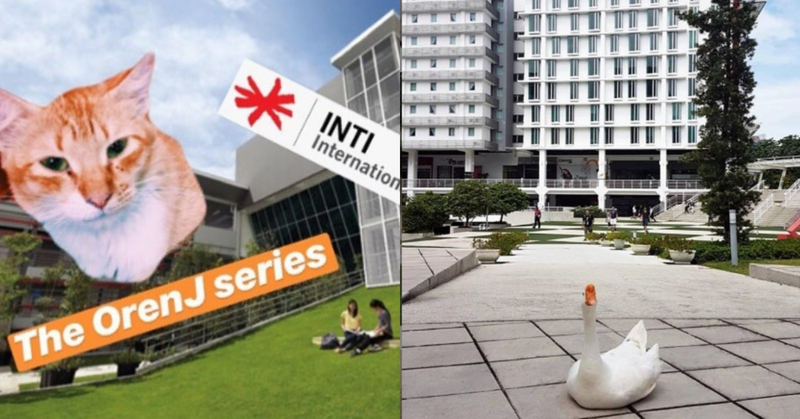 Taylor’s Lakeside is one of Malaysia’s Nicest campus around, but the campus isn’t what we’re talking about today instead what roams around it and we’re not talking about the student’s ether. If you visit Taylor’s Lakeside campus you’ll definitely come across Anthony, the goose. He roams around the lake and campus greeting (and scaring) students. This witty and humorous goose has been in the limelight for quite some time and recently took flight (pun intended) making a name for himself as Anthony the goose on Instagram and has since gained over 1,470 followers. Does your university or college have a pet that we don’t know of? Let us know in the comments!